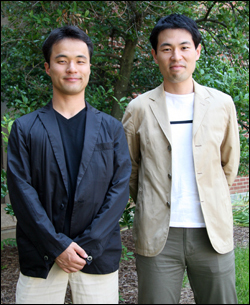 ISR welcomes two engineers from Honda R&D to our Visiting Scholars program. They will spend 14 months conducting research with ISR faculty, while immersed in American culture, language and business. Mr. Kensuke Iwanaga, an engineer at Honda R&D Co. Ltd. in Saitama, Japan, will be conducting research with ISR-affiliated Profesor Neil Goldsman (ECE). His research will involve device simulation for wide-bandgap semiconductor power devices. Mr. Tetsuaki Nakano is an engineer at Honda R&D Co. Ltd. in Tochigi, Japan. He will be conducting research with Professor P.S. Krishnaprasad (ECE/ISR) on intelligent and robust control for robotic systems.